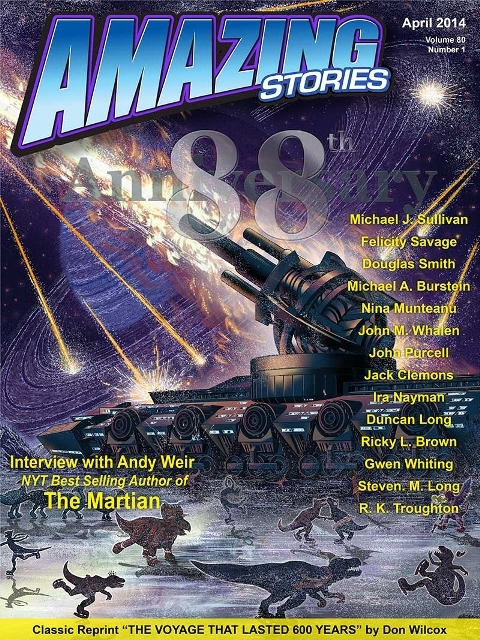 The world’s first science fiction magazine, Amazing Stories, will begin celebrating its 88th anniversary on April 1. Fiction and non-fiction will be published throughout the course of the month of April with a new story or article appearing approximately every three days. The anniversary issue will feature a classic reprint in association with FuturesPastEditions as well as thirteen other new and reprinted stories accompanied by new artwork, a science feature and a review and interview with the author of The Martian, Andy Weir. At the end of April the contents will be bundled together, formatted and offered as an E-zine. If the new issue is sufficiently popular, the publishers may do a print edition as well. This magazine revival follows Amazing’s return in January 2013 as a multi-author blog. Now edited by Steve Davidson, Amazing was founded in 1926 by Hugo Gernsback. The Canadian Unity Fan Fund is looking for nominations to be the delegate from Eastern Canada to attend the 2014 V-Con in Surrey, BC this October. CUFF provides for a Canadian sf/fantasy fan to attend Canvention on the opposite side of the country. Canvention is the annual convention of the Canadian Science Fiction and Fantasy Association. In 2014 CanVention will be held at V-Con 39 in Vancouver, October 3-5. In order to be nominated for the CUFF this year an application must be submitted by email to 2013.cuff@gmail.com or via mail to CUFF 2014, c/o 250 Jarvis Street, Toronto, ON M5B 2L2. Nominees must apply by April 27. Applications require a minimum of three supporters from the West and three from the East, plus a letter from the nominee including a self-description and an explanation about why his/her selection would be beneficial to the community. Any Canadian fan or pro may individually nominate a fan to be this year’s CUFF delegate by sending an email outlining your reasons for believing that the fan would make a good delegate to: 2013.cuff@gmail.com. Nominators who are not known to the current fund administrators Debra Yeung or Kent Pollard should provide a name and contact info for a fan who is known to one of them. Final voting will run May 1-21. Anyone may vote for CUFF who has been active in Canadian fandom for two years prior to the Canvention, (so for this year, October of 2013) or anyone who has a membership to Can-Con 2013. Voters are required to make a donation to the fund of at least $5.00. Photo here of Raquel in the movie. Kate O’Mara as The Rani in Doctor Who. Which was intriguing, since no doubt I had already seen her in Hammer’s The Vampire Lovers or The Horror of Frankestein, or perhaps one of her guest roles in Danger Man, The Saint, and The Avengers. O’Mara starred in the British teleseries The Brothers, Triangle, as well as a season of the American hit, Dynasty. She also worked on the British stage, and authored books. But how is it now, I keep seeing that videotaped visage…? New Zealand fan Stuart Andrews passed away March 20 after a brief illness. 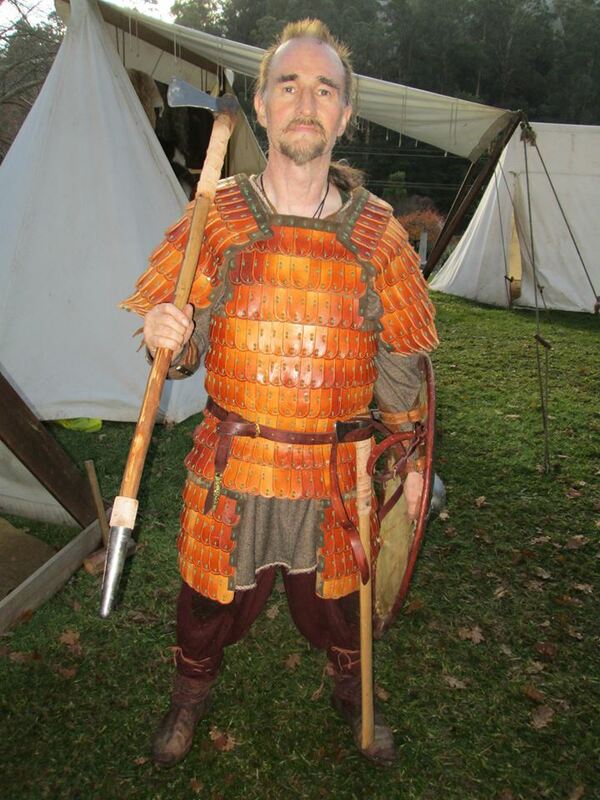 Nicknamed “Viking Stu” for his devotion to historic costuming, Andrews was also active in steampunk fandom. A service was held March 27. Andrews was dressed in full Viking gear when he was cremated. The People’s Court of the Internet is now in session, the Honorable Judge 770 presiding! You may be seated… Bailiff, read the charges. The Turkish Cultural Community of Austria accuses the toymaker Lego of perpetuating racism and prejudice against Muslims among children by making its Jabba’s Palace set look like a mosque. General Secretary Melissa Gunes: “We want to first of all have peace in our own home. This peace is endangered by war toys such as LEGOs ‘Jabba’s Palace.’ Peace at home, peace in the country, peace in the world. This is our motto! I hope that LEGO is helping to make this world. The internet’s let’s-you-and-him-fight media loved this story because it made both sides look bad and when there are two losing sides the cognoscenti can enjoy themselves twice as much. The figure of Jabba the Hutt towers over Ray Bradbury at the 2008 San Diego Comic-Con. Photo by John King Tarpinian. Lego looks bad because there is an undeniable grain of truth in the complaint. Star Wars’ Jabba the Hutt looks like Casablanca’s Signor Ferrari (Sidney Greenstreet) reincarnated as a mutant sea slug. Both characters control crime syndicates in desert cities. But Ferrari’s Casablanca existed only on a sound stage while the exteriors for Star Wars’ Mos Eisley were actually shot on location in Tunisia, imagery Lego extrapolated into a grandiose headquarters for a villain that arguably resembles the Hagia Sophia in Istanbul. Are we supposed to pretend that it doesn’t? On the other hand, the protestors’ complaint has a kind of easy-to-criticize, past-sale-date quality. Jabba’s palace was shown in The Return of the Jedi in 1983 without any known fuss. Starting one now? The story intrigued me because I’ve been inside the Hagia Sophia. I was fortunate to travel to Turkey and see some of its greatest historical and archeological sites in 2004 — although that was not the most auspicious time for an American to be traveling there, just three weeks after the Abu Gharib photos were published. No, indeed. Our Turkish tour guide felt the urge to take the microphone a couple of times and air his opinion of the Bush administration. Otherwise, things went pretty smoothly. Well, except the afternoon I was ripped-off by an Istanbul cabbie who realized I was ignorant of the exchange rate and bilked me out of US$75 in Turkish currency for a six block ride. A more serene individual would have been thrilled by this authentic connection to tourist traditions reaching back to the founding of Constantinople. Not me.